As is evident in the city’s name, Oakland was named for the large area of oak woodland that originally grew in the region back when it was settled. These days, however, most of original oaks have died or been removed, and those that do remain are mostly limited to the Oakland hills. So it seems baffling why the East Bay Municipal Utility District (EBMUD) would want to remove a flourishing oak grove from its lands within the city of Oakland. 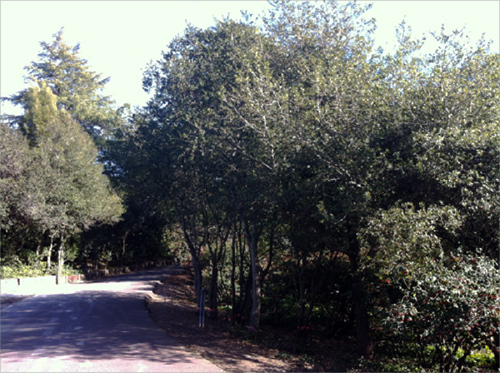 I’ve had several recent posts showing how oaks in Santa Barbara are flourishing after fire mimicry treatments. Here is another set of photos from a grove of oaks in Santa Barbara that have been receiving fire mimicry treatments for the past four years. Compare these results with the results in this same grove posted last year after three years of treatments. Marine haze comprised largely of sulfate aerosols produced by ocean phytoplankton is a possible source of acidity in the rain in Big Sur. Photo by Lee Klinger. I’ve been remiss in not posting this sooner. Here is the summary data for the 2011-2012 rain season in Big Sur. During the season we received a total of 25.49″ of rain, which is below the average of the previous four years (32.25”). The rainy season lasted for nearly 8 months, with the first rains arriving on October 4, 2011 and the last rains falling on May 27, 2012. Rainfall from 29 events, totaling 25.13″, was measured for pH. The season volume-weighted average pH was 4.91 ± 0.16. This mean pH was higher than the average of the previous seasons (mean volume weighted pH 2007-2011 = 4.77). For summaries of previous years see “Acid rain in Big Sur 2010-2011 season summary“, “Acid rain in Big Sur 2009-2010 season summary”, and “Acid rain in Big Sur”. 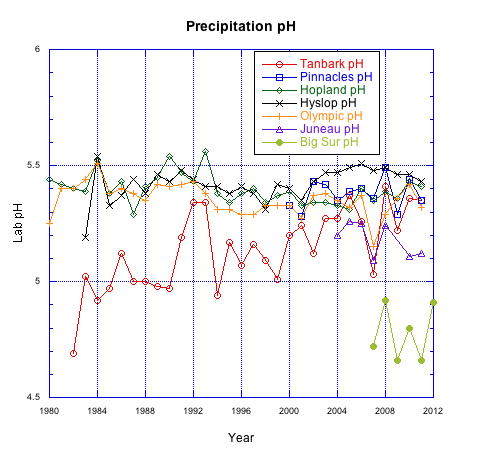 The graph below shows the mean volume-weighted pH values recorded from Big Sur for the past 5 rain years, along with the mean volume-weighted pH values reported from six National Acid Deposition Program (NADP) sites along the Pacific coast, from southern California (Tanbark) to southeast Alaska (Juneau). Note that the NADP sites have data only through the 2010-2011 rain year. Data for the most recent rain year are not yet available from NADP. This graph shows that the rainfall pH readings from Big Sur are significantly lower than those at the NADP sites near the Pacific coast. As I mentioned in last year’s summary, some of this difference is possibly due to the fact that the NADP sites report “lab pH” and the Big Sur readings are “field pH”. Typically the “lab pH” readings are higher (less acidic) than “field pH”. Another reason is that the Big Sur station is significantly closer to the Pacific Ocean than the NADP sites. 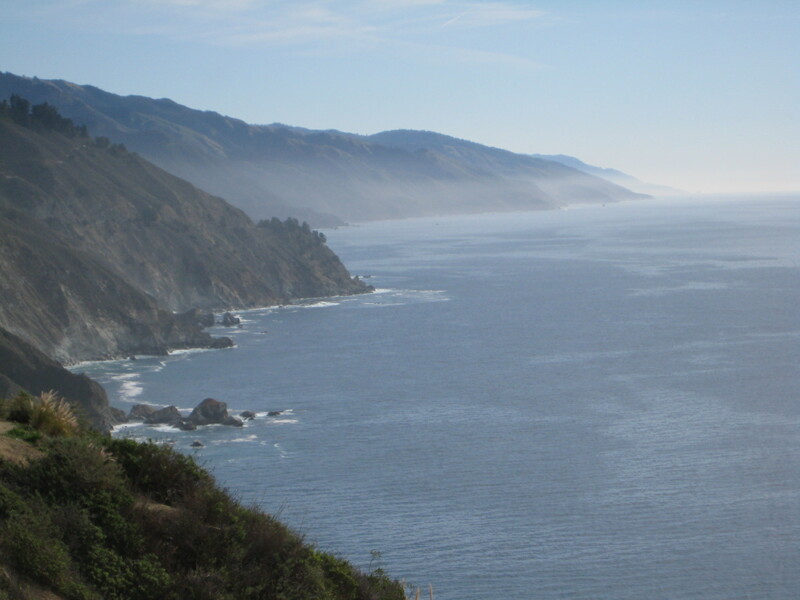 If the Pacific Ocean is the source of much of the acidity, as I suspect, then the lower readings at Big Sur could be due to the closer proximity to the source of acidity.